In Grandpa's third letter, he's feeling homesick. The weather is bad, he's breaking out, his money may run out, and the theater in town doesn't compare to the one at home. I'm intrigued by his line, "I pray that nothing interfere with our plans," which makes me wonder what the interference could have potentially have been. As I was organizing Grandma's photos recently, I noticed that Grandpa makes his first appearance in a photo from 1935. My grandparents (one assumes) were engaged by 1939 or 1940. So wonder if family could've been a problem, especially their difficult fathers. 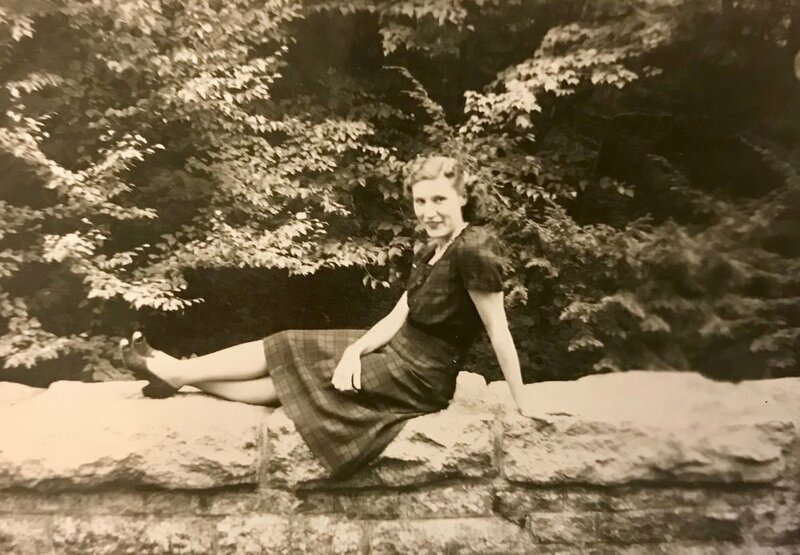 Here's an undated photograph of my grandmother from perhaps the late 1930s. Who took this photo? Balalaika, the movie Grandpa saw, was a 1939 American musical romance film based in Imperial Russia on the eve of World War I. The Comerfield Theater in Scranton opened in 1937 and was the jewel of the city. It featured grand staircases, murals, plush carpeting, mohair seats, and air conditioning--which was a modern innovation. The Fabian Theater opened in 1925 in Paterson. It held over 3000 seats and was one of the biggest theaters of its time in New Jersey. It featured a two-ton chandelier, tile floors, murals, and Turkish baths (!) in the basement. So I can see why Grandpa missed his old theater! Here it is the end of another day, the time I miss your loving company most. While I am working I think of you often but when night time comes I think of you always. And when I go to bed I pray that nothing interfere with our plans. Yesterday was an exceptionally gloomy day, the wind howled as rain fell, sometimes in a drizzle and then in a heavy shower. But when I went out in the rain, I wore the reversible coat and the thought that it was your gift to me cheered me up some. Otto and I went to see "Balalaika" at the Comerford theater. I think this theater is supposed to be the best in town but it does not compare in size with the Fabian in Paterson. We did not go for a ride Sunday as I told you we might but we spent most of the time indoors at the house where Otto is boarding. Otto and I were talking about going home this coming week-end and from the way it looks now the only thing that may stop us is a severe snow storm. I haven't gotten my pay yet and I hope I get it before the money I have is gone. The money I have should last me until Saturday. The change in my diet isn't doing my complexion any good but perhaps it will clear up a little this week. I no doubt have been eating too many sweets. Now my diet is becoming more regular again as I am trying to avoid sweets. Isn't it strange what the different kinds of sweets will do to you. For instance you my sweet make my head reel when I kiss your sweeter than sweet lips. That is the one sweet I do not want to avoid because I cannot do without them. I must close this letter now but please try to write to me as it will mean so much to me. I will try to let you know definitely when I am coming home until then good night and God bless you. With all the love my aching heart can bear.